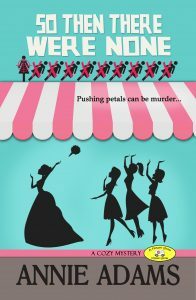 So Then There Were None: A Tale of Ten Little Bridesmaids is a thrilling standalone in The Flower Shop Mystery Series of cozy mysteries. If you like lots of laughs, hair-raising plots, and twists that keep you guessing, then you’ll love Annie Adams’ delightful homage to an Agatha Christie classic. Preorder this book today, it launches on January 1, 2019! Only 99 cents if you preorder, after that, the price goes up to $5.99. Annie Adams is the author of The Flower Shop Mystery Series and the Rosie McKay Mystery Series. She lives with her husband, two giant dogs, and two, too giant cats in Northern Utah at the foot of the Wasatch Mountains. When not writing she can be found arranging flowers or delivering them in her own Zombie Delivery Van.